We recently completed our staffing for the 2009 season. We hired a new guide named Kevin Hogan. Kevin is eagerly awaiting his guide training which will start later in the month. In the meantime he has been getting out and climbing a lot. Kevin Hogan and I headed up Friday afternoon for the ceremonial gate opening of the N Cascades HW. After killing sometime in Marblemount chatting with Civil War re-enacters about the intricacies involved in fragging Yanks we drove up and found a building waiting line at the gate. Leading the charge was Tootsie, who for the last 20+ years has been giving out cinnamon rolls and coffee to anxious East-bounders. We picked up our raisin-loaded rolls while she says that I "look like the mean one. You need something sweet"... Tootsie is a sweet lady but luckily all I got was the roll. The gates opened a little before 8pm and we rolled to the Easy Pass Trailhead pull-off to discover just under freezing temps, snow down low that was firm and consolidated... conditions that looked good, a face that looked good, with morale and excitement rising. We used the remaining daylight to find the bridge over Granite and then headed back to enjoy chilling views of the face before going in for the night. We started off at 3:40am to uneventful snowshoeing up the creek. We got to the base at a little before 5, geared up, stashed gear, probably started up around 5:30. The first ice pitch was fat and blue WI2, followed by a snow ramp that was firm. There wasn't much there in the next ice band. We found this left trending rock ramp traverse that Kevin excitedly took and deemed it M3ish... a few moves were pretty spicy. From there we headed up the ice band up the middle which was a little steeper and longer than it seemed from afar - probably AI3... Then we headed straight up toward the crux ice pitch, which we broke into two sections. 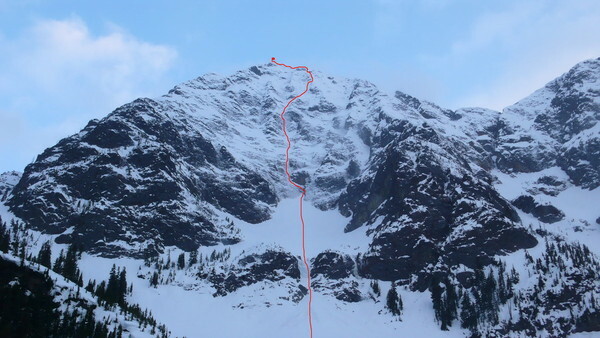 The first part was longer, steeper and run-out and the second -- which was about 2 body lengths of vertical ice (yes, 90 degrees) -- which tapered off towards the top - AI4. Up to this point we were regularly being showered with surface sluff slides, making it all that much more fun and picturesque climbing. From this point on the face the climbing stopped being as straightforward or fast... and fun? Nah. We had figured that the previous warm days would've consolidated snow on the mountain. Well, from the last ice pitch on up the snow was mostly loose and unconsolidated, being held onto the slope by a 2" solid top layer. Repeatedly we found areas where we'd ascend only a few feet a minute if that, hopelessly kicking deeper into the face to try to find some snow that would hold. Axe plunges were worthless at that point. Loosing your footing was a scary possibility. The order of the game was axe on one hand, picket on the other for pulling yourself up the loosest of the loose - this worked very well and saved a lot of time on the upper pitches. Protection was sparse, or just too hard to get to during those pitches unless you spent some time chipping at hidden and iced-up rocks, hoping that it would show some weakness, often only to find that it crumbled under your gear and you wasted all that time. Over the last five pitches we built the best bleay anchors that we could...and then the leader ran out the pitch to the end of the rope with the second eventually simulclimbing until the next good anchor could be found. For some odd reason picture-taking pretty much ceased at that point. Other than for use as essential climbing tools, pickets were worthless as pro on the snows of the upper mountain unless you dug very deep. With a good early start and efficient movement down low, I figured we'd top out at sometime between 12-2pm. Well, we finally topped out on the ridge at 5pm, having been on the face for almost 12hrs. On the route we picked, we avoided any cornice tunneling, instead finding a steep (up to 80+ degrees) snow ramp. With one last picket plunge, I pulled up and onto the ridge. We had a quick celebration and headed up towards the summit with our minds on the descent. We decided to go down through Easy Pass, probably because of the inviting name. 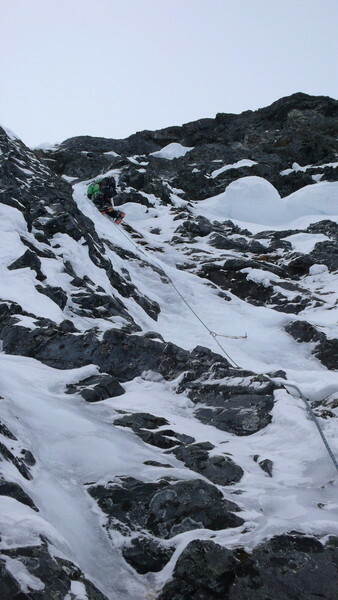 We found the South gully to indeed be easy. Walking down it was easy, the temporary whiteout was annoying...but easy. The long traverse was long and tedious, but easy. It took some time, but it was pretty easy. We were back at the base at 7 and back at the car at 8pm. The route is just stellar and delivered the full-on alpine experience that we expected to get from it. We were mentally exhausted, but fulfilled. After the climb we told each other that we didn't need to do that route again...maybe I just have a bad memory, but I'd probably do it again if persuaded. Kitty enjoys a balanced meal of milkshake and screws with ketchup. Kevin trains crushing mole hills in preparation for mountains. Tootsie hands out sugar-drenched rolls. Tootsie has been the first person to enter the closed section of highway for 20+ years. Bloody faces and Graybeard TRs seem to go together.